Updated January 22, 2017: Additional illustrations. The TTC begins its 2017 round of subway shutdowns on the weekend of January 21-22 with the complete closure of the Spadina line north from St. George Station. This is the first of a series of monthly weekend tests of the new Automatic Train Control (ATC) system leading to a planned conversion from Dupont north to Wilson in the fall. This is a prelude to opening the Spadina extension, which has only ATC, not “conventional” signals, to Vaughan at the end of 2017. Most of the closures are on Line 1 YUS because this testing is on top of shutdowns for routine maintenance work. Two three-day weekends, Easter and Thanksgiving, will see Line 2 BD shut down for work on the Prince Edward Viaduct. There are important changes for 2017 in plans for shuttle bus operations. For the Spadina shutdowns, the TTC will not attempt to operate a parallel bus service over the entire route as it is plagued by construction at some locations, and generally provides a long trip south to St. George Station. Instead, bus service will be improved on east-west routes to get people over to Yonge where they can make the trip downtown quickly on the subway. A “parallel” bus service will operate only on the north end of the Spadina line between Downsview and Lawrence West Stations. In past years, the scope of some shutdowns has been wider than the subway track layout and the locations of turnbacks would imply. The reason for this is that the power feeds to many potential turnbacks are not designed to support operations when power is available on only one side of the location. An example of how this was fixed is at Bloor crossover. This allows trains to terminate at Bloor in either direction even if the power is off south to Wellesley or north to Rosedale. When the line was designed, the crossover itself was the gap between two power sections, and so this could not be a turnback point if power was cut on either side. This change, including the resignalling of the crossover, was installed as part of the North Yonge subway project. Power supplies at crossovers at Rosehill (south of St. Clair), College and King have not yet been modified, but this is in the plans as part of the ATC project on the Yonge line. The new signal system will include the ability to manage these crossovers remotely as is done at Bloor. A similar problem exists at some of the older turnbacks on the BD line. Whenever work is underway on the Viaduct, subway service has ended at Pape (although it physically operates west to Chester centre track) because power cannot be cut on the Viaduct without also cutting it at Broadview Station. The TTC will be installing a gap in the power feed just west of Broadview Station so that trains can use this as their terminal. Shuttle buses on Danforth will not be required (only from Broadview westward), and subway riders will have access to the downtown streetcar lines as an alternate route to the core on Dundas and King. A planned shutdown at Union would normally have required shuttles south on Yonge below Bloor, but subway service will be operated using the crossover at King. This will be done on a manual basis because the new signals and controls for the crossover are not yet in place. This tactic will also be used in 2018 when work at Davisville would have required a shutdown north of Bloor. Instead, the crossover at Rose Hill will be manually operated so that shuttle buses can make their connection at St. Clair Station where there is an off-street loop. Shuttle bus operations have gradually improved, notably by actively changing the traffic environment in which the buses must operate rather than simply hoping for the best as the streets were. Parking restrictions, signal changes and the use of Paid Duty Officers were much needed changes, although one must wonder why it took the chaos of previous years’ events to show that replacing the subway with buses required a lot of accommodation by users of the streets. Many types of work were undertaken during the shutdowns beyond the most obvious track and signal upgrades. These are described in the presentation to the TTC’s Board on January 18. Of particular interest was one project that is not illustrated in the report, the replacement of 900m of subway track on the western part of Line 2 with a new form of rail support. 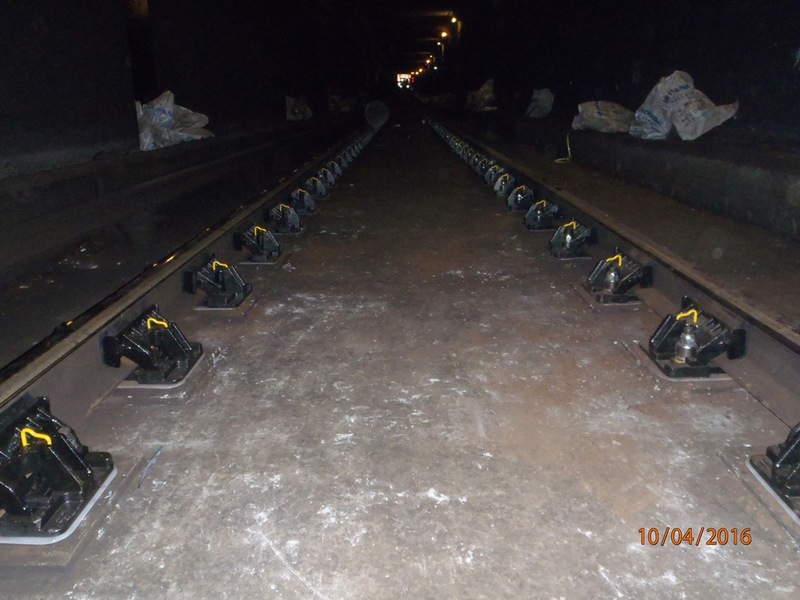 All subway lines built before the Spadina line opened have the track mounted directly on the concrete tunnel floor with only a rubber pad that doubles for both vibration and electrical insulation. Spadina saw a shift to the “floating slab” technique where the rail is mounted to large concrete sections that in turn sit on large rubber pads. This structure requires a deeper tunnel, but it provides better vibration isolation. Older lines cannot be retrofitted because adding a new layer of support would make trains too high for the tunnels. The TTC has installed an experimental section of track where the rail is supported from the side rather than from below with rubber pads gripping the track below the head of the rail. 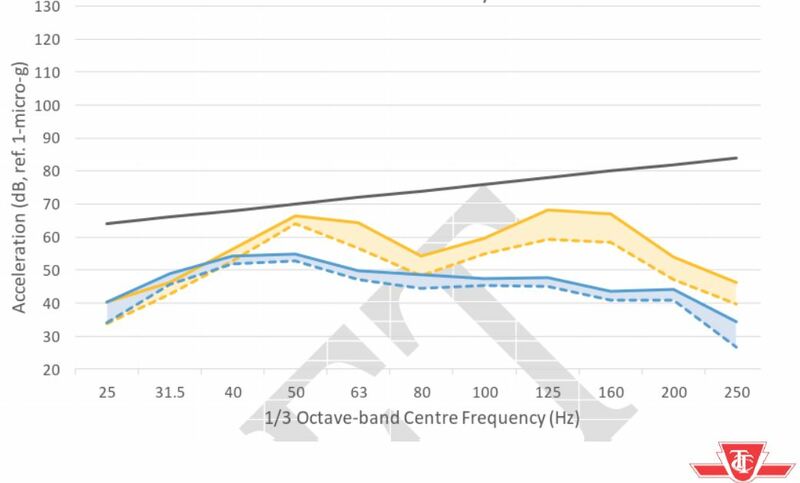 The result is a roughly 20db reduction in vibration. This is a trial, and there are currently no plans or funding to retrofit other problem sections of the subway. 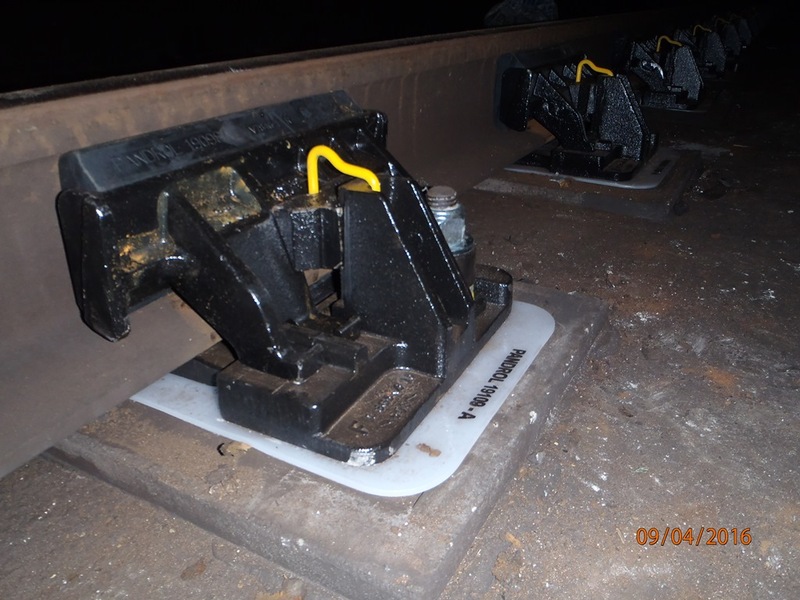 The new track suspension system is described on the vendor (Pandrol) website, and illustrated below in photos provided by the TTC. The following illustrations are from a presentation provided by the TTC. 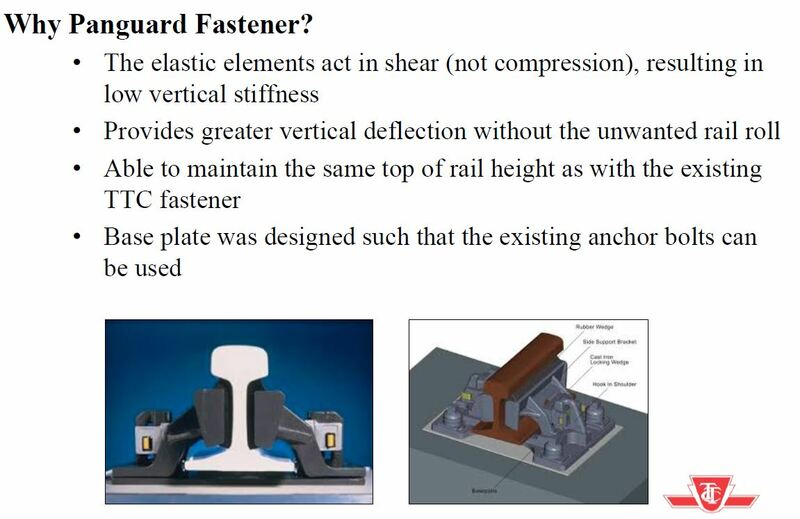 The first gives the rationale for use of the Panguard track mounting system and includes a good cross-section of the track suspension technique. 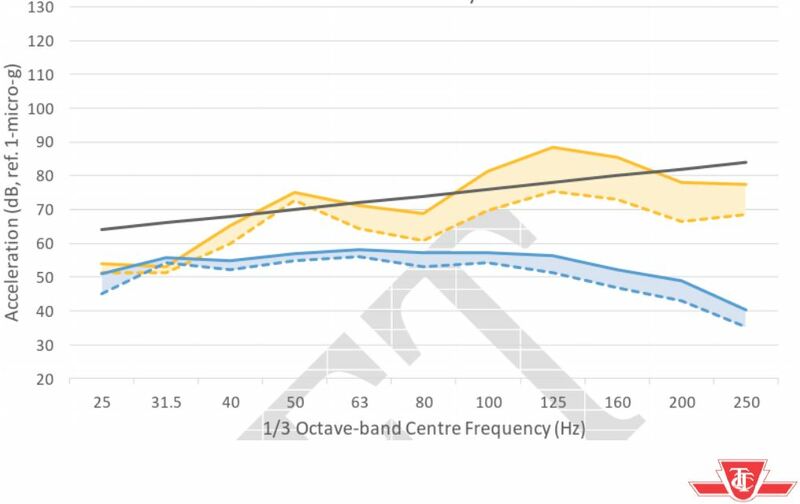 The following diagrams show before (yellow) and after (blue) vibration measurements. No funding. Again the main reason the TTC cannot make improvements because of the beancounters, without genuflecting before them and making cuts elsewhere. Steve: To be fair, it’s a trial, and now they know it works. Next issue is to get it in the capital budget for locations where there will be a real benefit. This varies immensely due to ground conditions. This explains alot. I asked Brad Ross about the turnbacks during the Priority One last week at Yonge. I always thought that the power was only cut one station on either side and not all the way to the viaduct. I wonder what their reasoning was behind cutting the power past Castle Frank. One thing I wish they would do but won’t is modified shuttles on Bloor. Anyone who tries to board eastbound at Yonge whenever there is a closure from Pape to St George is hopelessly out of luck. I mentioned to Andy on a couple of occasions that a shuttle running from Pape to Bay looping via Charles would not be a bad idea. As it stands right now, there is no chance of boarding between the turnback points due to the crowds. I have actually seen TTC personnel attempt to fight back crowds eastbound at Yonge in vain to prevent buses from being swarmed. What I was told about that idea was that such a shuttle service would be a logistical nightmare as people would be confused as to where the bus is going. In and amongst those discussions, they simply ignored the idea that crowding exists at Yonge (Whenever there is a shuttle service) and kept on spouting boilerplate that shuttles cannot carry the same load as a subway therefore there is nothing they can do. As always a good article Steve. Steve: When I said “manual” I meant it. The switch will be hand cranked and flagmen will protect movements south of Queen Station. I wonder if the TTC did something with the section of track between Dupont and St. Clair West. That section of track used to be very loud when the T-1’s did YUS but today the TR trains almost silently glide through that section. Steve: There are several possibilities including new track, and the fact that there is better sound insulation on the TRs. Steve said: When I said “manual” I meant it. The switch will be hand cranked and flagmen will protect movements south of Queen Station. Going back to the 1950s again are they… if I am not mistaken they had to do that when they were first installed which lead to them eventually being removed. I can see why they would want to at least try it but they will quickly learn the error of their ways. Manually throwing those switches plus the ensuing slow order will eat up time. It will take nearly 10 minutes to turn the trains. I can see them turning service at Bloor as well to avoid issues further north. Steve: Actually, they already know this is likely. But a train now and then is better than a parade of buses. I assume that the experimental rail mounting was done between Keele and High Park stations, in response to local residents’ complaints. Am I correct? Steve: Yes, although that’s not the only location with problems. I don’t know much about track technology, but I assume that there are considerably differing standards for newly laid streetcar track, compared with subway or GO rails. Aside from the slower speed, why does the southbound Roncesvalles track provide the smoothest ride in the GTA? It’s like riding on a linear cloud. Steve: Not sure. Most of the tangent track now in service was built the same way. There are too many weekend subway closures in Toronto. 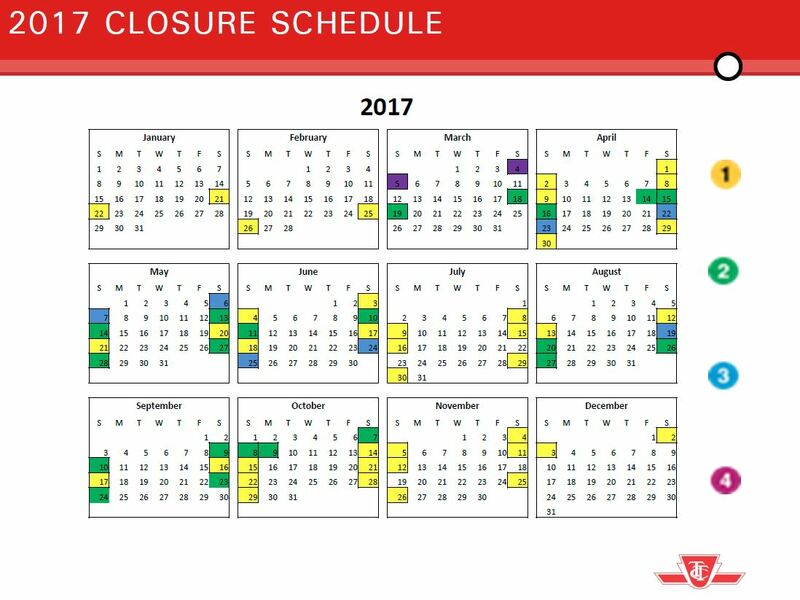 The TTC has scheduled subway closures for about 2/3 of weekends in all of 2017. More funding is required to repair the subway system and more work needs to be done at night in order to reduce the number of weekend closures. This means closing the subway earlier and going back to opening it on 9am on Sunday, which may inconvenience people but is necessary. The Toronto subway is becoming almost like the Washington Metro which has been forced to close subway lines on weekdays for maintenance. Steve: What you propose simply is not workable with the scale of maintenance involved. A weekend shutdown is the equivalent of well over a week of overnights because (a) the period is so much longer and (b) time is not lost to set up / tear down activities for every shift. There are some projects short enough to be accomplished in single nights, and where possible that is what the TTC does. Major trackwork, especially at junctions, is however quite another matter. 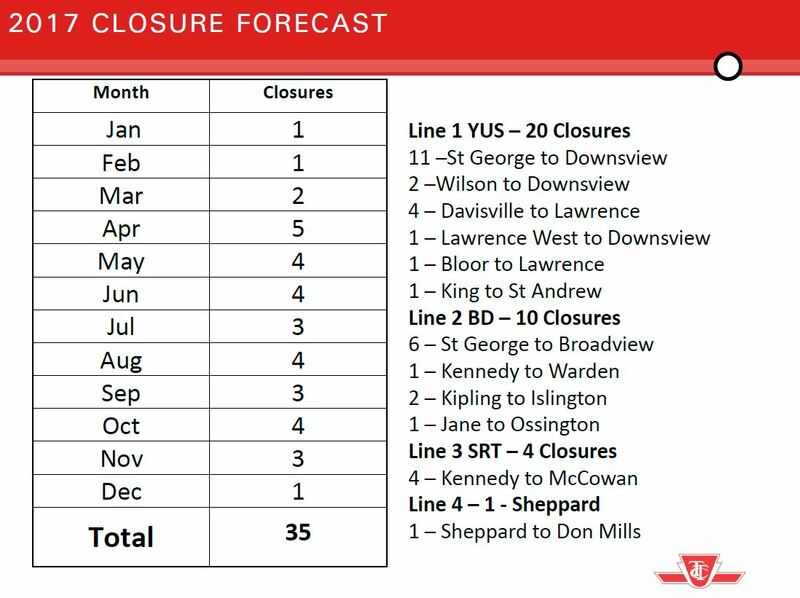 The lion’s share of shutdowns for 2017 is for ATC signal work on the Spadina line, and this is unavoidable. There are two weekend shutdowns for major work on the Prince Edward Viaduct. A 9 am Sunday opening won’t buy you much, maybe half an hour, because the way the 8 am opening was achieved was to convert trips that used to dead-head across the city before 9 am into revenue trips. In some cases, the TTC does schedule a late opening, but we shouldn’t need to do this every weekend. Also there are far too many special events practically every weekend between March and November (and sometimes outside of this time period and sometimes on weekdays and in rush hour) and City Council needs to limit the number of events and prohibit them entirely on weekends with subway closures. The most disruptive events like marathons and “Ride for Heart” should be cancelled entirely. “Ride for Heart” which closes the Gardiner and DVP, shuts down all GO bus service to Union, causes severe traffic congestion and severely delays TTC bus and streetcar service is scheduled for June 4, 2017 which is the same weekend that there is no subway service on Line 1 between St. George and Downsview. There are also subway closures planned on both of the marathon days. Hi Steve. What is going on at the Prince Edward Viaduct? I understand that there has been repairs to the floor slabs, etc. over the years, but recently they have wood hoarding around the walls and ceilings at both the east and west bridge portals. Thank you. Steve: The City is repairing the bridge piers, and the hoarding allows work to proceed without interfering with subway operations. Really interesting to finally see a decent solution to the vibration and noise problem of solid concrete roadbed. My local station is Keele, so I was able to check it out right away. The vibration and noise reduction and improved smoothness of ride was quite noticeable on the train or listening from the platform. Now I just wish they’d continue the installation into the station itself because the thundering of the above-ground structure has always been extreme. On the topic of the subway extension to Vaughan, don’t they still have conventional signals at the interlockings? I figured there would also be Station Time interlocking signals at every platform as was done on the Sheppard Line. Steve: Yes, I believe that there are signals at the interlockings, but will have to check. I know that on Yonge where they put back in crossovers that were removed that interlocking signals were installed. I believe that they are still there wrapped in black plastic but they might date from the time when they were just going to upgrade the signalling system and not put in automatic train operation. With ATO there should not be a need for the timing control signals as the ATO could keep the trains on time. Steve: I am not sure they have been installed at all three locations. Need to check at each site. 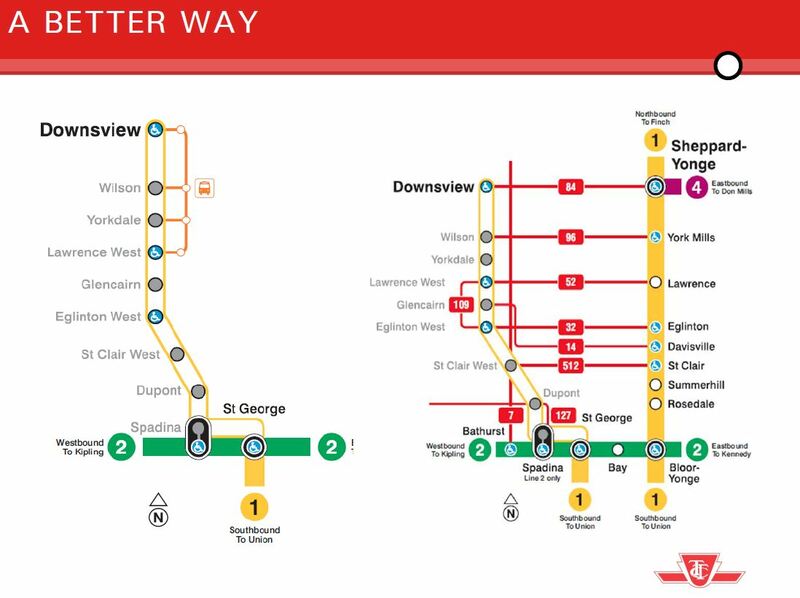 I think the idea of not offering parallel service on the university line from St George to Downsview makes sense, especially in the southern portion. However, how their set up increasing service doesn’t. There wasn’t increased service on long bus routes that connect to the northern part of the University subway line (like Lansdowne and Dufferin for example), with the exception of Bathurst. I think increasing say Dufferin Bus service during these period would also make a lot of sense.